Accelerate sample processing with the maximum g-force in a high-speed centrifuge. 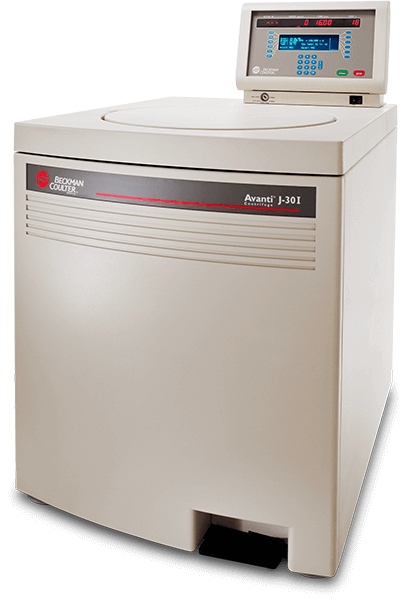 The J30I BioSafe Centrifuge achieves the fastest separations possible in the shortest time, with high performance. Samples spend more time at full force and less time in the centrifuge. The swinging-bucket and fixed-angle rotors provide maximum separation forces over 100,000 x g at speeds up to 30,000 RPM. The acceleration and deceleration rates of the J-30I are unmatched. Maximum capacity is 4.0L. Includes a HEPA (high-efficiency particulate arrestance) filter kit, which makes this instrument BioSafe.